We offer three, four and five-wire speaker station apartment intercom with five-wire handset and vandal resistant systems. Whether you desire to install a new system or replace or upgrade an old system, our apartment intercom systems are manufactured for either purpose. Choose from a variety of options depending on the number of entries of your facility and the desired features. We offer numerous options to cover all of your apartment security needs. Our apartment intercom entrance panels are customized to be vandal and weather-resistant. Features include an alphabetical directory panel or individual name holders next to each button. Both options are covered by a clear Lexan lens for protection. Also consider choices of surface or flush mount, postal release or engraved buttons for your entrance panel. Our apartment entry systems include 3, 4 and 5-wire speaker station versions, a 5-wire handset-type system, and vandal-resistant systems. These systems are used for both Replacements and NEW installations. Our apartment intercom systems are ideal replacements for old systems. Most old system wires can be reused with the new system making it easy to upgrade or replace. Custom panels are available in order to make sure to fit over the same spot as the old panel. Our systems are available in PVC, stainless steel and brass depending on the needs of your facility. When replacing an old system, it is essential to measure the size of the outdoor apartment lobby button panel. It is important to make sure that the new system will cover the old hole made at the main door; custom sizes are available. 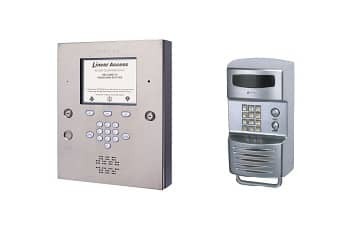 The following is a list of apartment intercom systems that we can most often replace: Tek-Tone Apartment Intercom, Auth-Florence Apartment Intercom, Pacific Apartment Intercom, Graystone Mircom Apartment Intercom, Aiphone Apartment Intercom, Leedan Apartment Intercom, Stainless Steel Entrance Panel, Trine Door Strikes, DoorKing Telephone Entry Systems, DoorKing Card Readers / Keypads, DoorKing, Residential Gate Intercom, H.E.S. 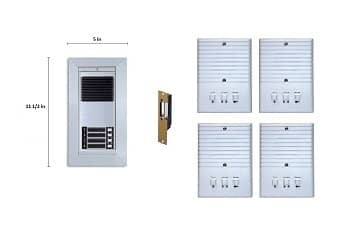 SMARTPAC, Apartment Intercom, Linear Telephone Entry Intercom, Jeron Apartment Intercom and NuTone Apartment Intercom. Upon completing the following quote form, your fully customized and complete replacement / new installation apartment intercom system kit will be instantly sent to the email address that you provide. You may call us or place an order directly from the quote PDF that is sent to your email. Always be sure to check your email spam box if your quote has not arrived within 60 seconds of submitting the form! 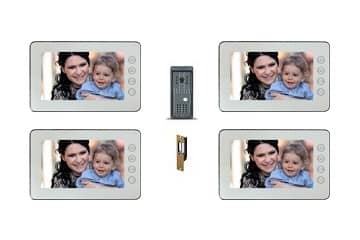 Our video intercom systems provide clear, uninterrupted video viewing of entryways or entire rooms. We have systems to accommodate as many as 300 monitors on one system. 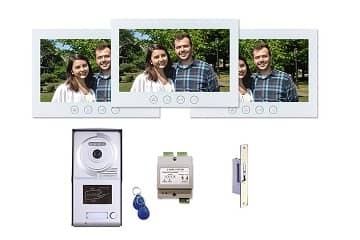 Choose from countless features available to suit your security needs. We also offer a non-video wireless intercom option for venues requiring access control without video. 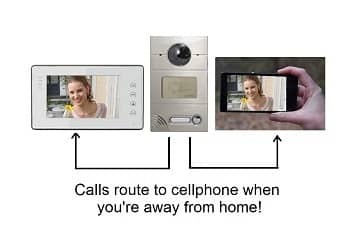 A single outdoor door entry unit functions with up to 99 indoor handsets. 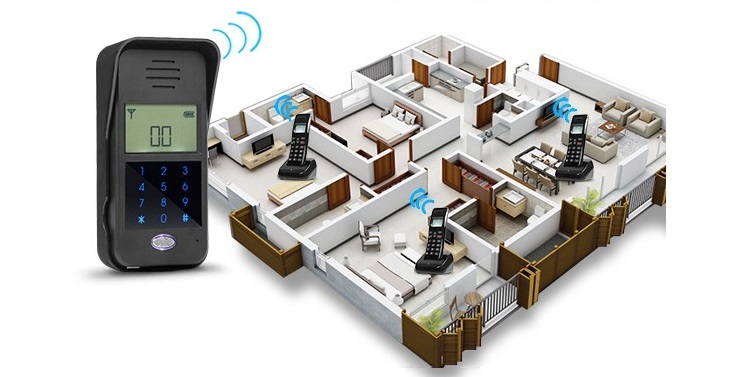 This wireless intercom system can be scaled in size to a single family home, multifamily apartment building or large business complex with various departments.